These pods fit in the Orion DNA GO, a refillable pod mod that allows for unique, customizable experiences. Each refillable pod can hold 2ml of vape juice and uses organic Japanese cotton wicking. 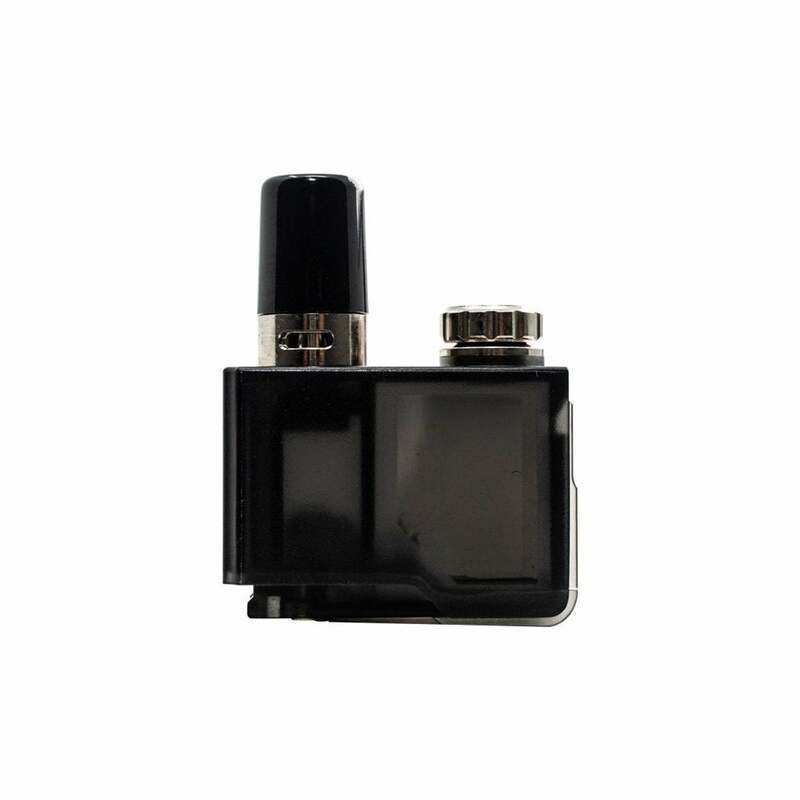 The mouth piece is adjustable, letting you customize the air flow for either mouth-to-lung or direct-to-lung vaping. The Orion DNA GO pods comes in two resistances, .25ohm and .50ohm. This DNA GO mod can automatically tell the resistance of your pod, and will adjust accordingly to give you smoother hits and better flavor. This product comes with two refillable pods in every package. To fill your Orion DNA Go Pod, twist of the cap located on the top of each pod and fill with your vape juice of choice. It is recommend to allow each new pod to sit for 15 minutes before use. Each Orion DNA Pod lasts for around 14 days. The only complaint I have is that the drip tip is faulty. After a while it starts to loosen and it gets lost. Love these pods my favorites are 0.25 but also purchase 0.5 both are great. No leaking, easy removal, & multiple flavors with a fresh taste not a mix of juice flavors. Last me a few days to a week to start tasting burnt. But I my vape more often than the norm? Decent price 2 pods in each box which was a fantastic surprise. $8.95 #OrionPods #OrionGo #Vapeon Thank u my fav Tobacconist! I had an experience similar to other reviewers with the first pod going burned and I was so disappointed because initially I thought it was the best designed and tasting pod device I had ever used due to quality of construction, large knurled top fill cap with a HUGE opening for filling (no need for a hypodermic syringe, no tiny pieces of silicon that fall on the floor never to be seen again) and GIANT organic cotton wick that goes halfway up the pod when I realized that was why it was burnt.... In order to keep the large cotton wick saturated I had to watch the fill level and make sure it was covered. I know that ordinarily that would be a real pain but since it’s so easy to fill it’s not a big deal. The other caveat is that I have to make sure that my device is turned off as the ignition button will go off as soon as I put it in my pocket otherwise. I got the DNA version by mistake because I didn’t realize that the other one was available and if I have to replace this later I will get the simpler one but that’s just a personal preference. the orion pods are complete trash. you have to let the coils soak for 15 minutes, take a couple of dry hits, first pulls on the weakest setting. all of that work for a coil that taste like cardboard and metal. Worst tasting vape I’ve ever had. Major disappointment. Pods get NO WHERE close to 400 puffs, they taste like cardboard when they’re not burned out and they fully burned out after 2 days. I hit my vape probably around 25 puffs a day, and one of the days was a work day and probably only hit it a dozen times. Complete trash, garbage waste of money. Extremely disappointing, the Orion had such potential, great design, dna chip, but the taste is worse than a vape from 2013. These are great! No mess and last all day! 10 second pod changeout for different flavors (f you want to). Last a long time! No leaky tank, easy fill coils last longer than most "tanks" I've tried. Taste is on point too. They work great for 2 or 3 days and seem authentic as the ones from the store as it gets and best price around, but I just don't get no where near as much life out of em as they claim you should! I use watermelon madness 50 nic. kinda sweet maybe that's why..? Soon as it starts tasting funky I have to trade it for a new one so I go through alot! The pods are built well and work great but I was having a problem with them burning out after 3-4 days of salt nicotine use. I googled optimized settings for .5 ohm pods using nic salts and found a good setting that I had to use Escribe to set. They lay about 6 days now which more reasonable but definitely still not great. Still the vape is great and the pods are sturdy and well made. Love that the tank filler is on the top! Top fill - the most convenient pod to refill! You won't be disappointed with this setup. I am amazed at the lifespan of these pods. Pods are easy to install and fill... performance is great! Authentic & the best price around. Fast shipping too! well made pods for the Orion DNA GO device. great job. I can't get more then three days out of these before they start trading burnt. Love my Orion DNA! Can't find these pods for this price any where else. Super fast shipping.